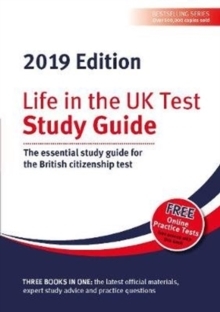 The 2019 edition of the best-selling series includes the complete testable materials from Life in the United Kingdom: A guide for new residents, the official Home Office materials. Passing the Life in the UK test is a compulsory requirement for anyone wanting to live permanently in Britain or become a British citizen. This practical study guide makes preparing for the test a lot easier. The new edition includes: A foreword from the German comedy ambassador to the United Kingdom, Henning WehnUpdated advice on specific question formats and clear advice on how to avoid common mistakes. Focus points to help target your studies. Completely revised practice tests, based on customer feedback and the direct experience of our editors. This means we offer accurate and up-to-date advice on what the test is really like. Clear and easy to understand diagrams illustrating complex topics. Key advice from successful students and FAQs. The 2019 edition includes advice on what to study, the kinds of questions to expect and unique study aids. Our appendices help students develop the comprehensive understanding they will need to pass the test. This book offers detailed advice on the types of question you will be asked in the official test. Purchasers also get a free subscription to online practice tests at www.lifeintheuk.net, along with up-to-date news and information. This book provides students with everything required to help them pass their test with confidence.